Do you like speedruns? Of course you do. They're incredible, mesmerizing feats of human determination. Do you like them enough to watch 135 of them for a week straight, though? Well, if you'd like to speedrun the very concept of speedrunning, now you can, with games ranging from Final Fantasy VII to, um, Rock Band. 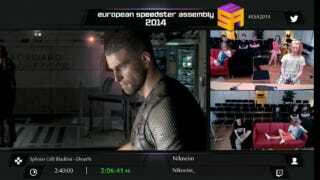 The European Speedster Assembly is hosting a week-long speedrunning marathon, featuring a billowing list of 135 games, from classic Mega Man to Dark Souls to, yes, Rock Band. Somehow. And if that doesn't do anything for you, there's always William Shatner's Tekwar. Yes, that's a real thing, and it's on the schedule. The marathon technically kicked off yesterday, and it's running until late Saturday. If you're feeling generous, you can sweeten the pot with a donation that lets you shake up a stream a little—for instance by adding a new challenge or, um, picking the radio station in Grand Theft Auto. All donations go to Doctors Without Borders. There are two streams running concurrently, both of which you can find below. Happy watching.